Electrical properties of a transistor can be described by showing the interrelation between the various voltages and currents. These relationships between voltages and current can be displayed graphically and the curves obtained are known as the transistor characteristics curves. In our previous tutorials, we explain how a transistor works as a switch, an amplifier and an oscillator. In this tutorial, we are going to explain you to transistor characteristics. The most important characteristics of the transistor are the input and the output characteristics. Here we explain input and output characteristics of all three Transistor configurations in detail. (i) Input characteristic: The curve obtain between the emitter current (Ie) and the emitter-base voltage (Veb) at constant collector base voltage Vcb shows the input characteristics. The emitter current is generally taken along y-axis and emitter base voltage along the x-axis. 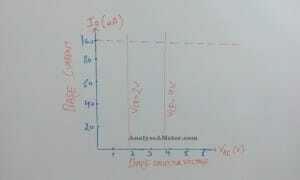 (i) The emitter current IE, increases rapidly with small increase in emitter-base voltage VEB. It means that input resistance is very small. (ii) The emitter current is almost independent of collector-base voltage VCB. As we know, as a very small ΔVeb is sufficient to produce a large flow of emitter current Δ Ie, therefore, input resistance is quite small of a few ohms. 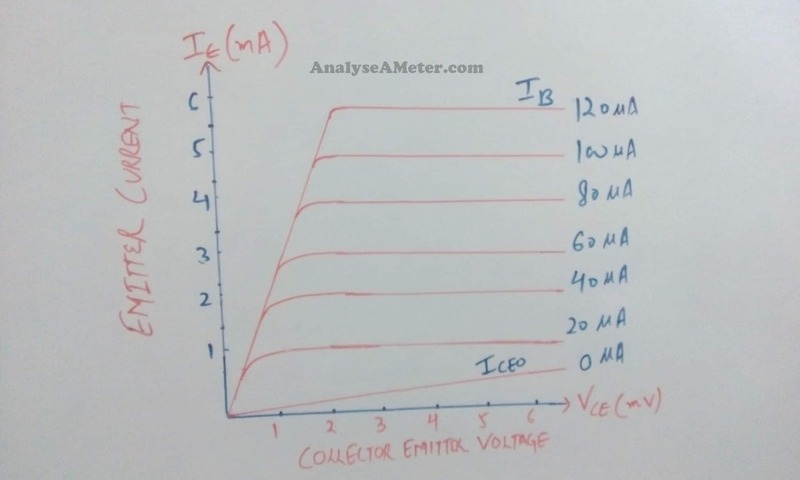 (ii) Output Characteristics: The curve obtains between the collector current (Ic) and the collector-base voltage (Vcb) at constant emitter current Ie shows the output characteristics. The collector current is generally taken along y-axis and collector base voltage along the x-axis. (i) The collector current IC varies with VCB only at very low voltages (< 1V) indicates that the transistor is never operated in this region. (ii) When the value of VCB is raised above 1- 2 V, the collector current becomes constant as indicated by straight horizontal curves. (iii) As shown in graphs, very large change in collector-base voltage produces only a very small change in collector current. This means that output resistance is very high. (a) Output resistance: It is defined as the ratio of the change in collector base voltage ΔVcb to the change in the collector current Δ Ic at the constant emitter current Ie. 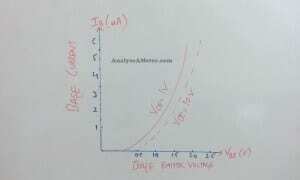 Therefore, Output Resistance ( ro ) = Δ Vcb / Δ Ic at constant Ie . The output resistance of the common base circuit is very high of the order of several tens of kilo – ohms. 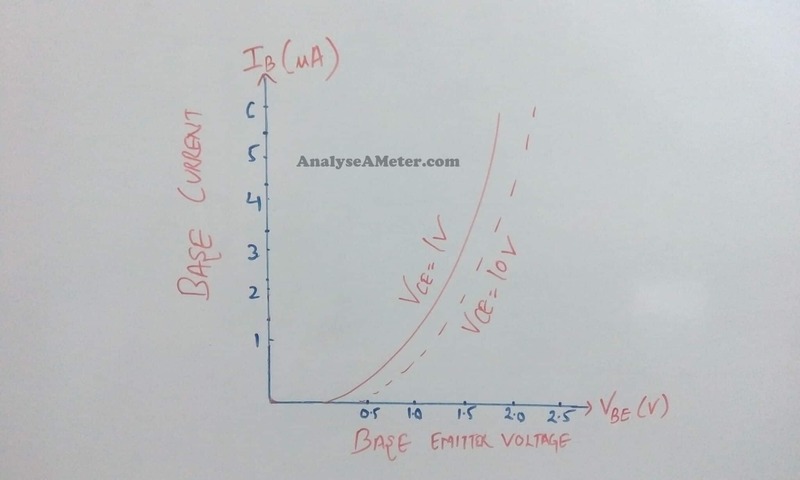 (i) Input characteristics: The curve obtain between the base current (Ib) and the base-emitter voltage (Vbe) at constant collector-emitter voltage Vce shows the input characteristics. The base current is generally taken along y-axis and base-emitter voltage along the x-axis. 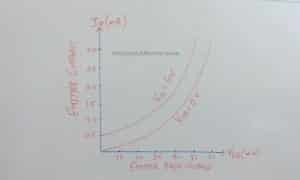 (i) The characteristic obtains is similar to the forward biased diode curve. It indicates that the base-emitter section of the transistor is a diode and it is forward biased. (ii) As compared to the common base arrangement, IB increases less rapidly with VBE. 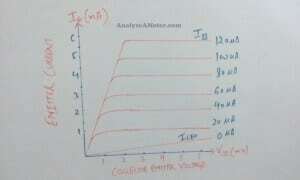 Therefore, the input resistance of a CE circuit is higher than that of CB circuit. The value of the input resistance for a common emitter circuit is of the order of a few hundred ohms. 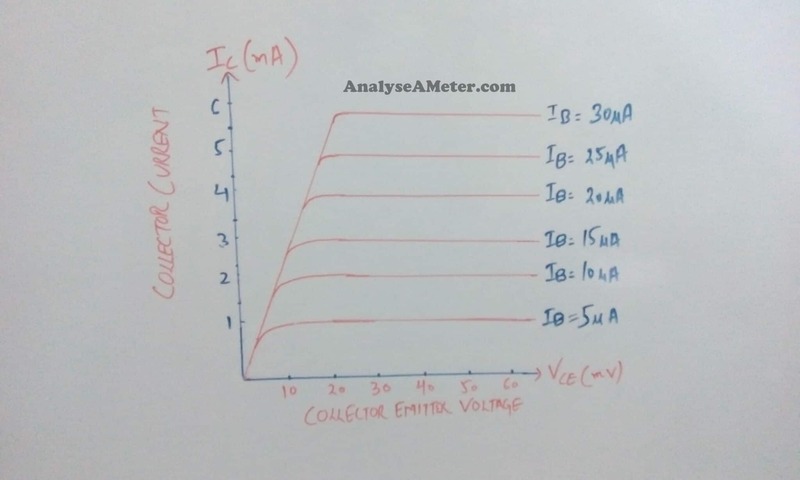 (ii) Output Characteristics: The curve obtains between the collector current (Ic) and the collector-emitter voltage (Vce) at constant base current Ib shows the output characteristics. The collector current is generally taken along y-axis and collector-emitter voltage along the x-axis. 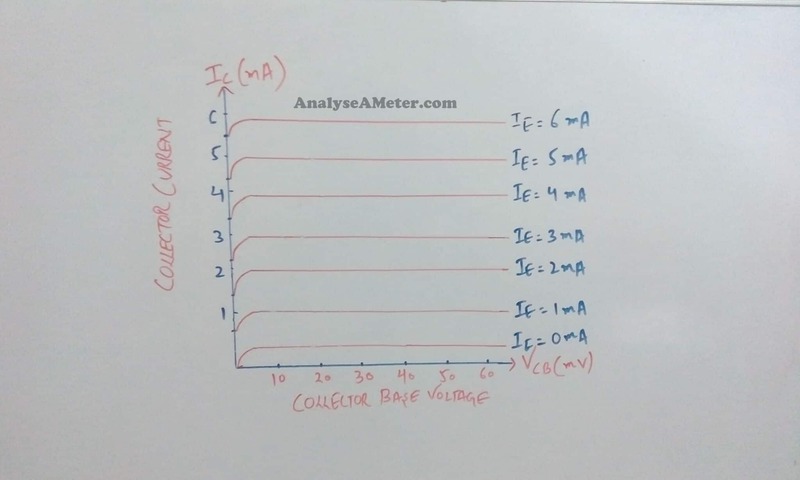 By keeping the base current Ib at a constant value like at 5 µA, note the collector current for various values of collector-emitter voltage. Repeat the process for various values of base current Ib . (i) As we know, collector current IC varies with VCE, and this becomes almost constant and independent of VCE. This value of VCE up to which collector current IC changes with VCE is called the knee voltage (Vknee). The transistors are always operated in the region above knee voltage. (ii) Above knee voltage, IC is almost constant. However, a small increase in IC with increasing VCE is caused by the collector depletion layer getting wider and capturing a few more majority carriers before electron-hole combinations occur in the base area. 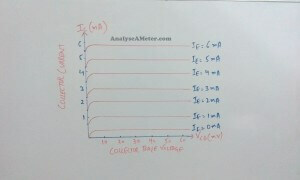 (iii) For any value of VCE above knee voltage, the collector current IC is approximately equal to β × IB. (a) Output resistance: It is defined as the ratio of the change in collector-emitter voltage ΔVce to the change in the collector current Δ Ic at the constant base current Ib. Therefore, Output Resistance ( ro ) = Δ Vce / Δ Ic at constant Ib . The output resistance of the common emitter circuit is less than the common base circuit. Its value is of the order of 50 KΩ. 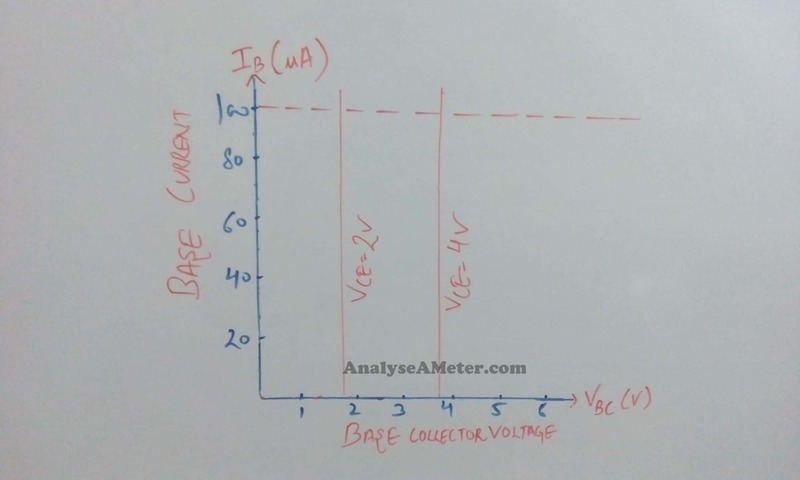 (i) Input characteristics: The curve obtains between the base current (Ib) and the collector-base voltage (Vcb) at constant collector-emitter voltage Vec shows the input characteristics. 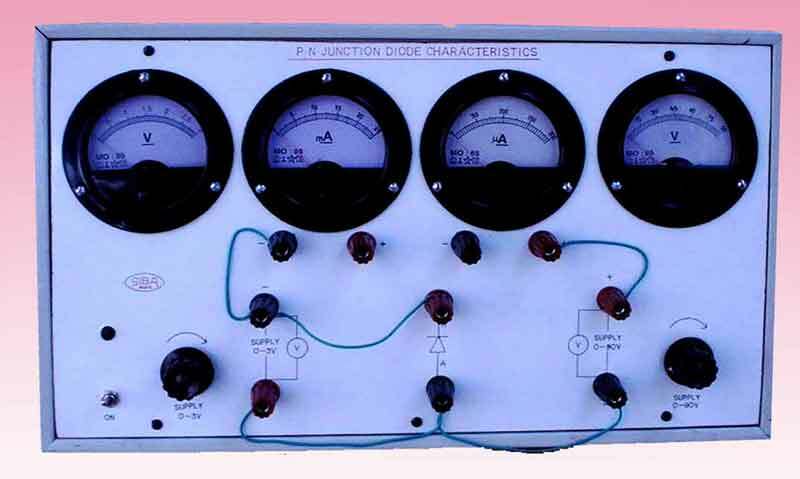 The base current is generally taken along y-axis and collector-base voltage along the x-axis. 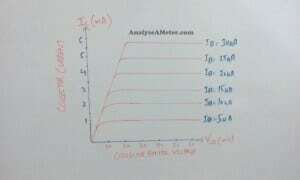 (i) By supplying suitable voltage between emitter and collector, the input voltage Vcb start increasing rapidly. (ii) It is also noted down that when collector base voltage (Vcb) increased, the base current (Ib) got decreased. The value of the input resistance of common collector circuit is very high. 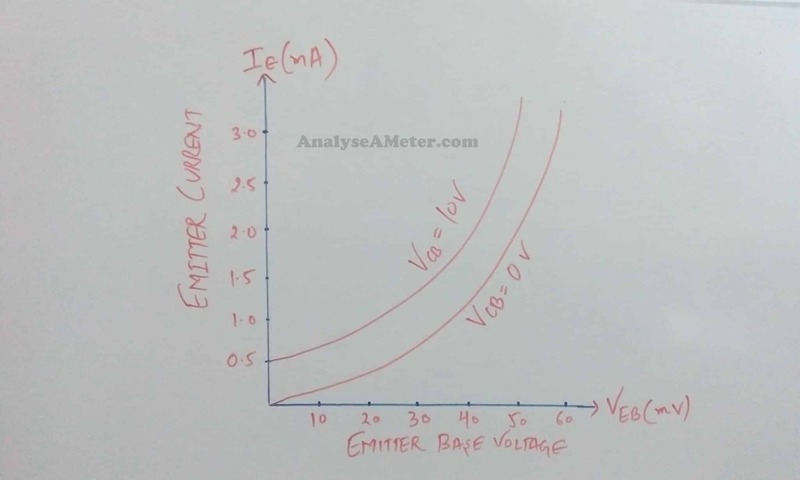 (ii) Output Characteristics: The curve obtains between the emitter current (Ie) and the collector-emitter voltage (Vce) at constant base current Ib shows the output characteristics. The emitter current is generally taken along y-axis and collector-emitter voltage along the x-axis. (i) Characteristics of the common collector circuit are practically identical to the common emitter circuit characteristics. (ii) Its current gain characteristics for different values of Vce are also similar to that of the common emitter circuit. (a) Output resistance: It is defined as the ratio of the change in collector-emitter voltage ΔVce to the change in the emitter current Δ Ic at the constant base current Ib. The output resistance of the common collector is very low i.e. about 50 Ω.